XML document is commonly used to share the data on the internet. The data provided in XML format are able to update frequently and parsing them is a common task for network-based apps. Android DOM (Document Object Model) parser uses an object-based approach to create and parse the XML files in android applications. The DOM parser loads the XML file into memory to parse the XML document. Due to this reason, it consumes more memory. In this example, we parse XML data and display them into ListView. Add the ListView in the activity_main.xml layout. Create the XML document empdetail.xml in assets directory to parse the data using DOM parser. 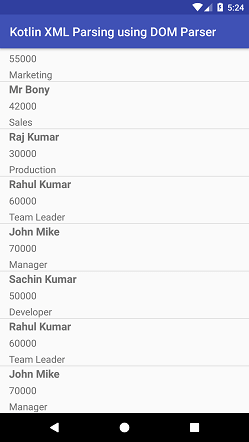 Create a custom layout to display the list of data into ListView. Add the following code to read and parse the XML data using DOM parser. Create the instance of DocumentBuilderFactory, DocumentBuilder and Document objects. The HashMap<String, String> is used to read the data from XML document and add them into ArrayList().